Last week Pope Tawadros issued the latest in a long list of fiery statements, when, in a visit to Norway, he remarked: “We can pray in a nation without a church but we can’t pray in a church without a nation. The statement is an attempt at nationalism to support Egypt. Yet the notion of Christianity was never founded on nations, but on people having the same faith and the same values. On a philosophical level, the church is not the building itself but the congregation, but given Egypt’s history of state endorsed sectarian attacks on churches, the statement tends to undermine the historical struggle of Copts trying to build houses of worship and the attacks on such places. This is not the first instance of nationalism for the pope. Earlier he had endorsed the constitutional referendum, going so far as to say ‘Yes brings blessings’. Later he also described President Abdel Fattah Al-Sisi as a hero of the revolution. The question was clearly rhetorical. It angered some because it implicitly denounced human rights. But anger aside, the real problem is in trying to answer that question as though it was not rhetorical. What is terrorism? Is it not fear that harm will befall you for no good reason? Harm is when something damaging befalls you or when to bodily harm by another human being, your right to be able to defend yourself against accusations brought against you, your right not to be humiliated and insulted through words or actions, through racism, through sectarianism. Terrorism is when innocent people are targeted, harmed and forced to pay a price they should not have to pay. If there is a war on “terror” as they say, how can that war be waged using the same exact tools that make up terror? How can you fight the violation of rights through other violations of rights? These violations are supposedly what the fight is against. This fight should not just change the perpetrator. There can be no moral victory when the efforts to combat terrorism legitimise acts of terrorism. There can be no moral victory when those who are more powerful have the right to perform these acts. True terrorism is related to the acts themselves and not to who performs it. By fighting terror with terror, terrorism wins, and those claiming to fight it end up contributing to it. Are mass death sentences not terror, particularly when a judge finds out by chance through reading the papers that he sentenced a child to death? Is torturing people not terror? And even if we put human rights aside, do Christian values allow for torture and execution, even in a country facing violence? Human rights help safeguard basic rights, and the state is always accountable whenever these basic rights are violated. I’m not certain what Pope Tawadros meant by a mistaken understanding of human rights. How different does he think human rights values are compared to basic Christian values? The pope is not just a political figure commenting on values; he is a spiritual figure, positioned to represent and safeguard a set of values on behalf of an entire faith. The pope is supposed to be the ‘salt of the earth’, but the commentary of late is tasteless, if not bitter. In much the same vein, many following the pope have adopted shaky moral stances in favour of nationalism. In a television interview, Anba Bola said that the murder of protesters outside Maspero at the hands of the military in October 2011 must be put behind us. In another incident a priest, Boules Ewaida, flattered Sisi’s good looks. The shift in church rhetoric from the spiritual to the political and the complete alignment with the regime is worrying and may eventually weaken the church. The pope’s attack on human rights undermines many Coptic struggles such as the right to practice freely, the right to express themselves, equality, citizenship and the right to a fair trial. 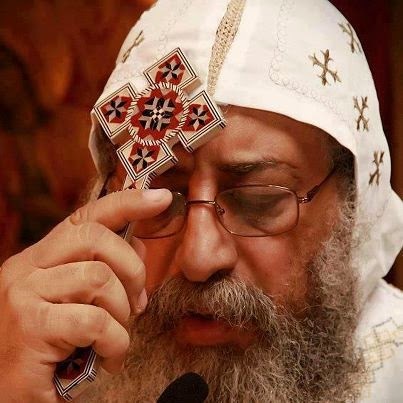 The fight for such rights has been integral to the Coptic plight in a sectarian state whose abuses have been well documented. So in answer to Pope Tawadros’ rhetorical question: Human rights are extensions to Christian values and the Christian philosophy of helping the poor and the oppressed. We cannot turn a blind eye to injustices when the state performs them. So, yes, now is the time to talk about human rights, human values and even Christian values because they are the only real weapons in the fight against injustice, the fight for our humanity, our fight for our values and our fight against terror. Now more than ever is the time to talk about rights and values, because now, more than ever, is the time they are most needed.